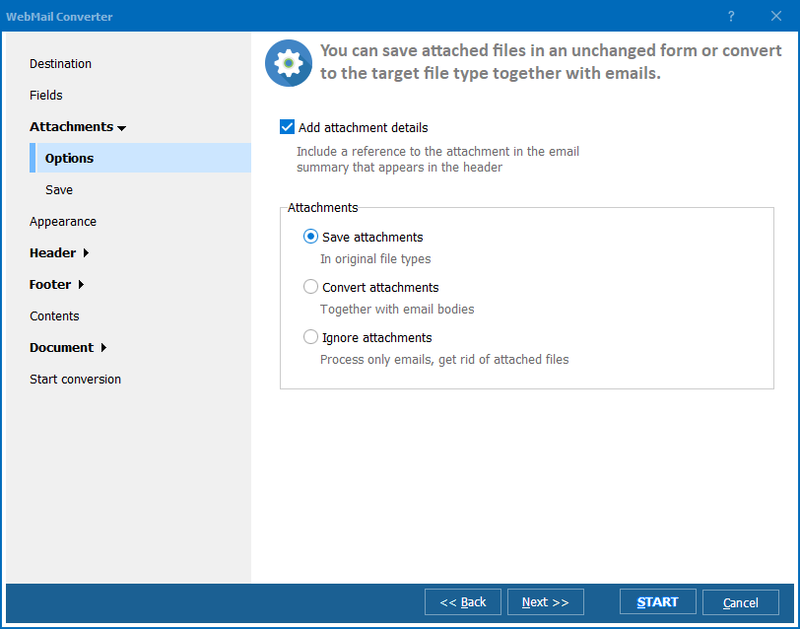 Save emails from Outlook.com as DOC in batches! You are here: CoolUtils > Total WebMail Converter > Save emails from Outlook.com as DOC in batches! 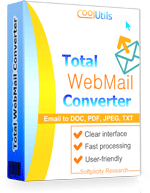 Total Webmail Converter has been modified to support Outlook.com and therefore can convert Outlook.com emails to DOC and other popular extensions, such as RTF, TXT, PDF, HTML, JPEG, TIFF. Unlike most similar converters, this one is available at an affordable price. Needless to say, there are a number of features, which make it truly outstanding. This converter connects to your email account instantly. You just need to launch the converter and enter your email address and email password. Now you have access to your messages via the program and you can save your correspondence in the DOC format. This email converter enables you to preserve all your messages and secure important information, which may come in handy any time. You can arrange all documents in your preferred order and name them in such a way as to make it easy to find one whenever you need to. Also, this program can be set up to process attachments in different ways. Install the program and launch it. 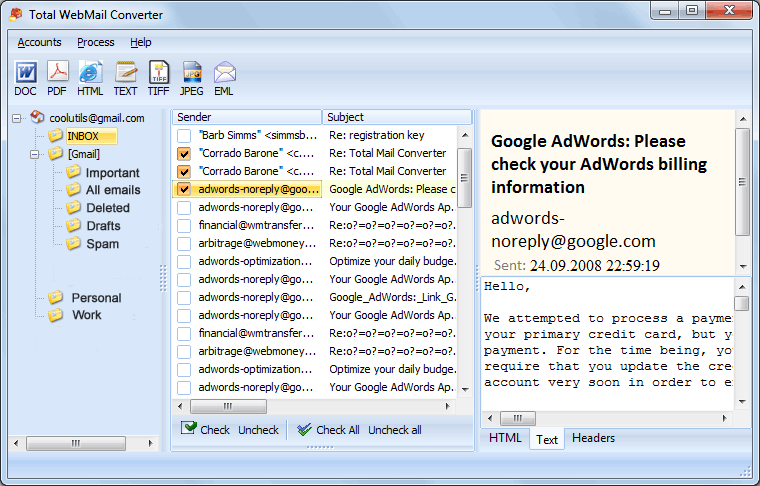 In the dialog, enter your email address and email password and press the Test connection button. Then press the Start button. View the folder tree and select the folder with your needed messages (Inbox, Draftbox, Sentbox, Spam, Trash). View the message list and check-mark the ones that you want to export. Specify destination and apply your preferred settings. Here you can either save your emails as separate files or combine them into one big DOC file. Also, you can choose to ether keep folder structure or not to do that. Set appropriate folder name. Move on to the next tab and set your preferred file name template. 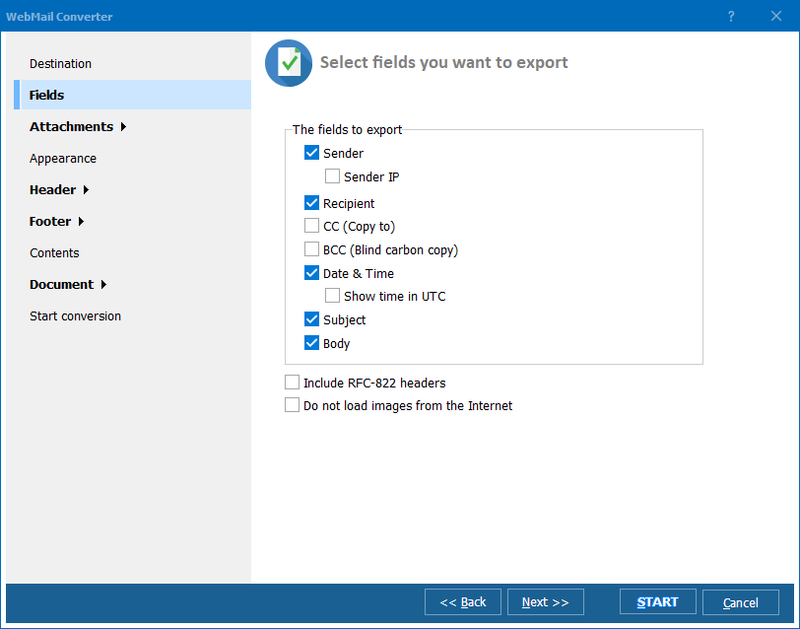 Check the fields, which you need to export. Process attachments, if any, in your preferred way. Tune appearance for your output DOC files. Adjust paper size and set margins. Review the parameters using the Start Conversion option. Press Start to export your emails to DOC. To check the program's functionality, download the demo version for free. Now you have 30 days to test the functions mentioned above.